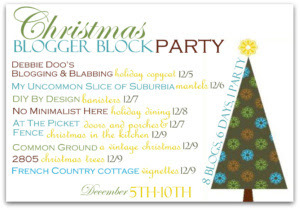 As I said in my Doors and Porches Party Post last week (the link is still up by the way so come join in the fun! ), I would love nothing more than to fling open my front door and invite you all in for a cup of coffee or hot apple cider…not all at once though…cause that would be A LOT of coffee and cider! But, this will have to suffice for now so please, come on in. Last year I went a little more “blingy” when decorating my banister. But, this year I just decided to keep things a bit more simple. Bows done up with a buttery yellow ribbon provide just a soft touch of color and sparkle. I used berry garlands (cut down to size) to create these little wreaths at each pick-up. For some extra umph I wrapped the berry garland around the greenery just at very front. Smaller berry wreaths are used in between the bigger ones. Two wreaths hang on the doors leading to the office (to the right of the front door). A simple piece of linen adds softness to my entry table. Faux Paper Whites take on a more realistic look when placed in a silver soup tureen ( a wedding gift from my grandmother) with moss tucked around the base. I didn’t even bother to polish it! And, an apothecary jar filled with faux cranberries finishes it off. Walk a little bit further and peek around the corner and you will find my built-in china cabinet. Simple touches add some Christmas cheer here too! Thank you so much for coming by to visit me this morning! Come back this afternoon when Heather will be welcoming you to her home! 31 Comments on "Banisters and Foyers~Welcome to Vanessa’s Home"
Your home looks beautiful Vanessa! I love the banister with the pretty bows and berry accents. Well done! STUNNING, Vanessa! You’ve inspired me to do a little more to my foyer–there’s no second chance for a first impression, is there? I love the welcome you’ve created! Vanessa, your home is absolutely gorgeous all decked out for Christmas! Every detail is so beautiful! Your home is beautifully decorated! You did an awesome job! You’re amazing! Everything is so pretty! Love your banister and front door!!! Your garland turned out so pretty! It doesn’t look like you skimped on it at all! I like the added berries on it too. So beautiful. From the entry on. There are so many good ideas here. It’s looking de lovely and elegantly festive!! I still need to do my bannister!Oi! Beautiful Vanessa! Really makes me wish I had a banister to decorate!! So Very Pretty and Festive… Thank you so much Ladies for Making mention of my Linky Party and Joining in as well… Have a blessed week!! Beautiful! I love the stairs garland. It’s so pretty. Wow! Love the banister, that is just a showstopper! The berry wreaths are such a pretty addition. Also those two wreaths on the french doors, those had me at hello! Great job girl! This is really lovely, Vanessa! I love that picture from the entry where you can see the staircase and your tree in the living room. Beautiful Vanessa!! I love your pretty staircase all draped in garland! Both you and Heather have done such an outstanding job this Christmas season. You girls are so talented and I think it is the coolest that you do this together, yet are far apart. Love it all! Your foyer and banister look absolutely gorgeous. I love the berry wreaths and the faux cranberries. I am in love with your silver tea set. I have been wanting that forever. It always looks so elegant. Vanessa, this looks just gorgeous. You have done a wonderful job decorating your home for the holidays! Your Christmas decor is so inviting. What a beautiful way for guests to be greeted! Heather’s banister gets in on the act! Enjoying all the beautiful past and present pictures of your home and realizing your entryway wall color is exactly what I’m looking for. Can you tell me the color name and brand?